Here is a question for all you blog readers out there in the archaeosphere. Was Halley’s Comet visible in the skies above Orkney in the later Neolithic, say around 3000BC to 2500 BC? The reason we ask is that we appear to have our very own “Comet Stone”, which bears a very fair resemblance to Mr Halley’s favourite object. Claire found it in Structure Ten and it features a circle with three slightly diverging lines trailing after it. No doubt all those who apply astronomy to archaeological alignments will be delighted. We are just delighted to have it. Structure Ten has been a busy building. 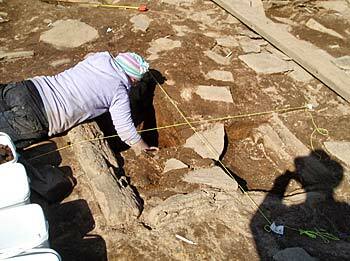 Sarah continued to excavate the central hearth in quadrants. It has turned out to be absolutely massive – some 1.4 metres square and 30 centimetres plus deep. A few yards away, Mike is still wrestling with the entrance and, as you will see from Emily’s blog, which follows, there are slight differences of opinion as to whether it is, actually, the entrance. The burden of the evidence, so far, is that it is, indeed, the entrance area, as Mike has also discovered what appears to be its basal courses and elaborate elements, including orthostats, which seem to be part of the entrance arrangements. And still in Structure Ten, Mark and Adam have been working behind the location of the now-removed dresser and have discovered a paved area with an upright stone, which was central to the dresser. Intriguingly, it also appears to be central to the major axis of the building – straight through the central support of the dresser/altar and the hearth. It is just possible that this little upright stone was the marker around which the building was designed symmetrically, which gives an interesting insight into the mind of the Neolithic architect. 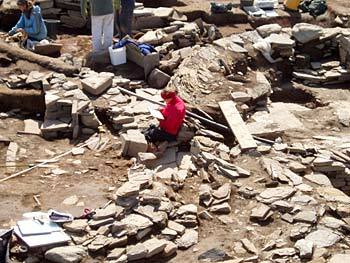 In Structure Eight, Dave was preparing to plan the area of the structure, which has been excavated down to floor deposits. But, while laying out his equipment, he glanced at the bench arrangement which runs along part of the western wall and realised that it may actually be part of the wall of one of the earlier structures which run under Structure Eight. It seems to have been adapted during a later phase of use and turned into the bench arrangement we see now. Meanwhile, Hugo’s team, in the northern corner of the trench, were preparing Structure Eleven for some major photographs. It’s been a battle against the wind as dust and grass continually gets blown about, but, as you will see, they did a grand job. Even although they have still to reveal the primary floor, already you get a good sense of what may be another beautiful structure along the lines of One, Eight and Twelve. In Structure One, Antonia has been going through the building examining each stone for signs of incision. It is time-consuming work, but the results have been spectacular. In the last week or so she, has found 36 new examples of incised stone and this brings the total for this remarkable building to over 60. In Structure Eleven, Kim and Jane are removing deposits and more of the wall faces are becoming apparent, together with a neat little alcove in a wall. Close to them, and wielding a mattock with his usual expertise, Gavin made a substantial area of deposit vanish in moments to reveal more of potential outer wall of Structure Eleven. It is now the end of week four. The pace at which time passes is alarming, but, as Nick said, some amazing work has been done and the site has been altered beyond recognition from the start of this season. Hi, my name is Scott, I’m a graduate from University of Glasgow with a joint honours degree in archaeology and philosophy. I came to the Ness of Brodgar on recommendation from my friend Ally, who’s been studying, and working, in Orkney for the last two years. 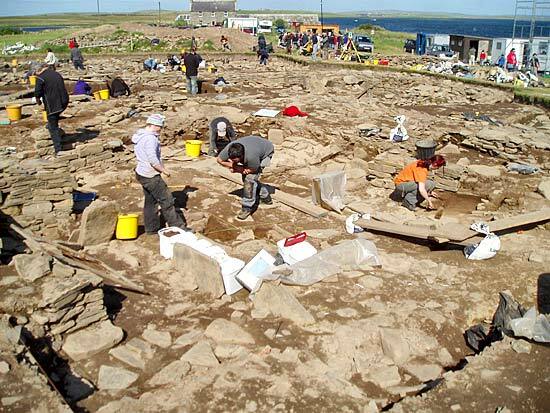 I had been on a few digs throughout my undergrad, but nothing that compared to the size of the Ness of Brodgar, so I was very excited about digging here. It’s my last day, so I asked Roy if I could write a blog about digging on the Ness, entitled, How I Learned to Stop Worrying and Love the Midden. On my arrival, I was placed under Dan’s supervision in Trench One, otherwise known as the Central Midden Area (CMA). At first I was a little disheartened by this, as day after day of scraping through thick midden layers revealed little but the odd piece of pot, stone tool or small bones. It wasn’t until the end of Wednesday that things started to become more interesting as we got closer to the floor layer of Structure Eight, and we could start digging stratigraphically. Thursday’s sunshine led to the discovery of a previously missed piece of incised stone, sitting a little bit away from the bench at the end of the trench. Most exciting of all was that it matched previous incisions found, a small cross, with its corners joined by a curved line. It is upon this final day, though, that all the work has paid off. First thing this morning, Dave realised that the bench at the end of our trench was in line with the walls under Structure Eight, showing an earlier structure, that had then perhaps been incorporated into Structure Eight. I’m sad to be leaving site today, just as things were starting to look a lot more interesting for the midden. But I look forward to returning next year to see what has became of it. Hi! My name is Emily and I am a recent archaeology graduate from Cardiff University. 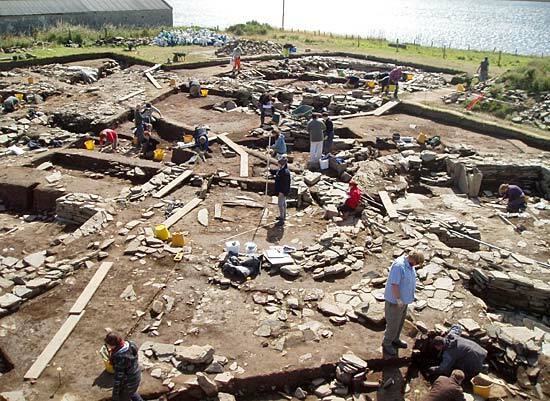 It is with a heavy heart that, today, after just two weeks on site, I say goodbye to the Ness of Brodgar for another year and set off on a new archaeological adventure at a hillfort in Somerset. This is my second year excavating here and, yet again, I have learnt a great deal, and have come to the realisation that a fortnight on this amazing site just isn’t enough. On my return to the site this year, I was pleased to learn that I would be digging in Structure Ten again – which has been both a privilege and a massive learning curve. 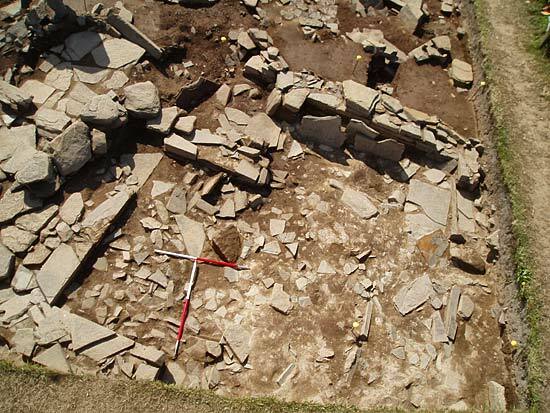 I spent the majority of my time here excavating a sondage over part of a robbed-out wall to the north of the central chamber, and, although I have only been here for a fortnight, it is great to see how much the structure has developed in such a short time. One of the primary aims in Structure Ten this year was to locate, and understand, the entrance, and after three weeks it looks like Mike may (may!) just have found it. Hurrah! However, as usual we are treating this with caution – as is often the case, with the Ness things are not always as they seem. Mike is trepidous, while Adam and Nick are quite sure. A particular interest of mine is portable material culture and the “biographies” of objects, whereby they are perceived as having their own “lives”, stories and live cycles, from the gathering of the raw materials to produce them to their use and eventual deposition. These objects were entangled in the lives of the people who made and used them and the Ness is the perfect place to develop this interest given the amount of spectacular small finds which are unearthed each day. The discovery, by me, of what was first thought to be haematite (a specialist later confirmed that it was, in fact, manganese), as well as yellow and red ochre in Structure Ten this year has allowed us to ponder further on the use of colour and decoration in the structures. So the time had come for me to wrap this up, so I’ll keep this short and sweet and say a massive thank-you to everyone at the Ness for another great year. It has been a privilege and a pleasure to work at this site once again and I wish Nick and co the best of luck with the rest of the season.